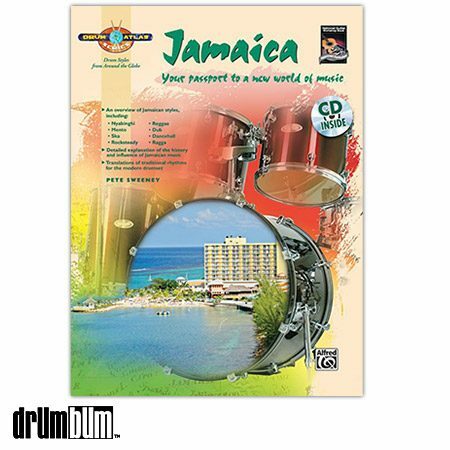 Drum Atlas: Jamaica Book / CD – Jamaican music is loved throughout the world for its laid-back feel as well as its intense, lively rhythms. Its influence is apparent across many musical styles, from the reggae rhythms in the music of popular bands like The Police, to ska beats in the music of groups such as The Mighty Mighty Bosstones and The Toasters. Even rap music evolved from the Jamaican vocal style called “toasting,” and the influence of Bob Marley is evident throughout the world of music and pop culture. Drum Atlas: Jamaica teaches you many of the enjoyable and challenging grooves and fills that make Jamaican music so unique, covering early styles such as nyabinghi (sacred drumming that accompanies vocal chanting and singing) to modern styles like ragga (played entirely on digital and electronic equipment). Study techniques like the three-drop, the steppers beat, and the skank, and discover forces behind the musicùlike the spiritual influence of the Rastafarian religion. You’ll also learn how to translate rhythms from traditional instruments, such as the rumba box and timbales, to the drumset. With its wealth of ideas for modern drummers, Drum Atlas: Jamaica will inspire you to improve your technique, increase your knowledge, and make you a more well-rounded musician. The included CD demonstrates all the examples and compositions featured in the book, performed with a full Jamaican-style band. Softcover Book. Reggae Drums Books and more at DRUM BUM!